all those healthy food stuffs and there catching my eye is a massive tin of Guinness!!!!! I saw the Guinness as well! How do you drink that MUD?????? such fun to see someone elses fridge. what is in the bottle next to all the milk? I'd like the complete clean, unbroken, stocked fridge, please. Is the Guinness for your recipe? This is a fun photo Mel, I never thought to photograph the fridge. Ours is quite bare at the moment so I think it would look very pitiful! The bottle in the fridge door contains cherry, apple and grape juice, which is lovely! 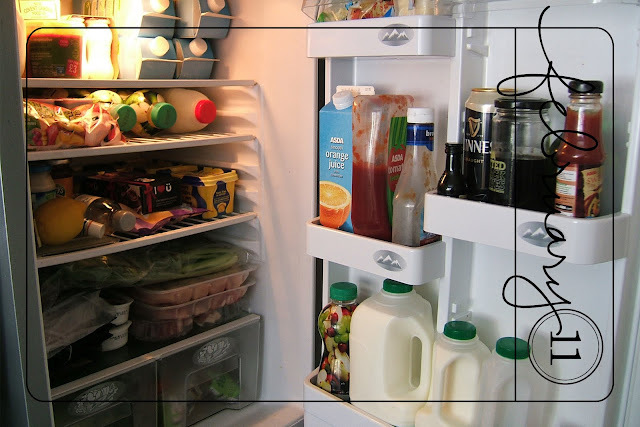 I just want to know: does your fridge always look so well organized? I can't imagine posting a picture of the inside of my refrigerator! LOL! Now, I do like a well-stocked fridge! Very satisfying. I've just seen Amy's comment. Sacrilege. I feel a minor sense of panic creeping on: THERE'S NO WHITE WINE. Mise, keep calm - it's just been cropped off the top left hand corner. I love it when I've done the weekly shop & the fridge is full...I even get cross when things get eaten...my DH has the habit of assuming that everything needs to be 'finished up'!! !